Stiva™ GALLERY 2.0 is now available. For all of you, who have the previous version of Stiva™ GALLERY, get the new major version for half of its price. 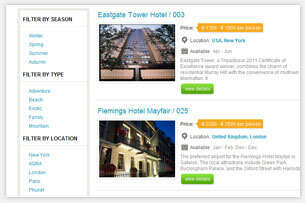 Travel Deals listing script for travel agencies and tour operators. Vacation Packages Script is PHP/ MySQL based travel script; a simple solution for travel agencies that will make it easy for everyone to publish vacation packages and travel deals. Role-based secure access and ability for administrators to create users with different level of access to the system. Property owners can post travel deals and packages, edit listing details and manage enquires through online administration page. Stiva Appointment Scheduler is a web based appointment scheduling software designed to be widely used for different kind of online services where booking and appointment management is required. 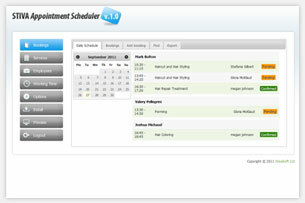 The appointment booking software can be a great implementation for dog walking websites, hair salon and beauty centers, babysitter services, fitness centers or tennis coaches. Full PHP Source Codes and Developer Licence available for the script! As a small business owner probably you always wished to have an extra mobility for yourself and your business. We now have the solution that will give you a free hand to devote to your daily tasks without worrying that you will miss a new business opportunity. With an SMS notification integrated into your web forms and scripts you will be notified in the minute as someone contacted you through your website. Impress your clients with your response time, quick and timely manner.